EventNut software adds speed, efficiency, and big-event polish to any event check-in process. Electronic attendee check-in is far faster and much more accurate than using spreadsheets and paper. 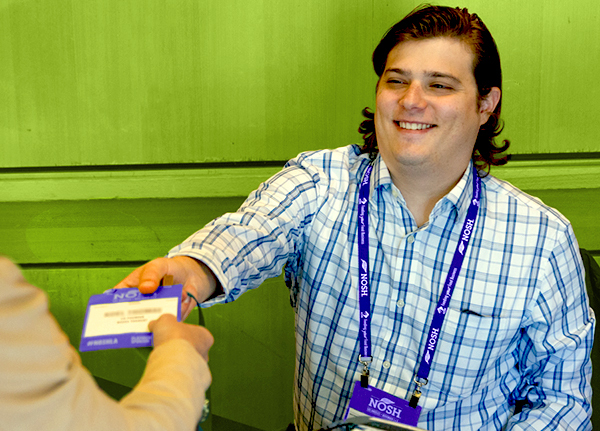 Things like mobile check-in and on-site badge printing make for a faster, more impressive attendee check-in process. VIP arrival alerts make for a more productive event overall. EventNut’s check-in software is easy to install and use. It’s also free, making EventNut an affordable way for events of any size to step up their attendee check-in games. Step up to electronic check-in. We make it easy. Scan in your event’s attendees wherever they arrive. Alert staff instantly when important attendees arrive. Process walk-ups and collect payments easily. Faster, Smoother Attendee Check-in. For Free. Use EventNut’s free attendee check-in software at your next event. Make a great first impression on your attendees. EventNut is about much more than just electronic check-in. We offer simple-but-powerful event software that’s designed to elevate every part of your attendee check-in process. Make your next event your best event. It’s never too early to start.